The night before you are going to bake bread, make a sponge by mixing the starter with the milk and 3 cups of flour. Cover and leave at room temperature overnight, or better yet, in the oven with the light on. I always turn the oven on to 350 degrees for one minute exactly when I’m trying to get my sourdough yeast to be most active. The next morning, stir the sponge before beginning. Then, add in the honey and eggs, stirring until incorporated. Look for “developed gluten” which is sticky and stringy and holds together quite well. Cover the dough with a towel and put it back in the oven with the light on, 350 degrees for exactly one minute and then off. Sourdough takes longer to rise than commercial yeast, so expect anywhere from two to four hours, depending on the strength of the starter and the heat in your kitchen. I almost always leave it for four to six, or longer if necessary! Have patience. Butter two 9×5-inch loaf pans. Once the dough has doubled in size, pour it into the loaf pans. I’m serious. Pour it. Cover the pans again and put them in the oven – you know the drill by now – with the light on, 350 for a minute and off. This is a great time to baby your starter, too, so keep it in that nice warm oven. Slash loaves down the middle, then immediately bake until they are honey brown and sound hollow when tapped on the top, 35-40 minutes. Be careful not to overbake this bread or it will be dry. Carefully remove the loaves from the pans and let cool completely on wire racks before slicing. 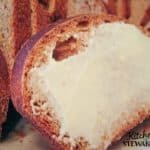 * I use half and half traditional (red) whole wheat and white whole wheat, red for the gluten content and white for the lighter flavor. Sometimes I also use part spelt or rye flour (remember that rye is highest in phytase, so a great flour to use with sourdough). The recipe is very versatile! * Feel free to use 100% water instead of the milk for a more frugal, dairy-free version. The loaf may be slightly softer with milk, but it’s good either way! * I also forget to set the butter on the counter sometimes and have replaced it with coconut oil in a pinch with fine results (dairy-free version).